The memo alleges the FBI abused its surveillance abilities to spy on a Trump campaign adviser. 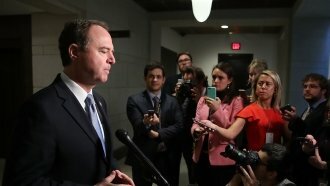 Rep. Adam Schiff of the House intelligence committee says a central part of a memo alleging wrongdoing by the FBI is untrue. The memo says an opposition research dossier on President Donald Trump produced by former British intelligence officer Christopher Steele was used to secure a warrant to spy on former Trump campaign adviser Carter Page. It claims that dossier had anti-Trump motivations that were not disclosed on the warrant application. All of that, they say, proves FBI bias against Trump. But Schiff says the application did disclose the dossier had "likely political motivation." The New York Times, The Washington Post and The Wall Street Journal have all since reported the court was, in fact, aware of the memo's political motivations. The FBI says it has "grave concerns" over the accuracy of the memo, partly due to omissions. President Trump declassified the memo Friday.